I’ve been reading your posts for a long time so I know you’ve both struggled with depression in the past, and encourage an “attitude of gratitude.” I have battled with depression for a long time, and it’s hard to be thankful when it seems like life is easier for everyone else and just doesn’t ever get any better. What do you suggest? We are all thankful for some things, and we can all improve with respect to our gratitude quotient! Give yourself credit for wanting to improve in this area. This aspiration alone pleases your Heavenly Father. “God loves a cheerful giver!” That includes one who will readily give thanks, gratitude and praise. Depression makes it hard to do anything, and more often than not, we tend to focus on the negative. When life is challenging, it can be hard to feel thankful. An attitude of gratitude focuses on the positive and temporarily takes your mind off your suffering. An attitude of gratitude focuses on the positive and temporarily takes your mind off your suffering. 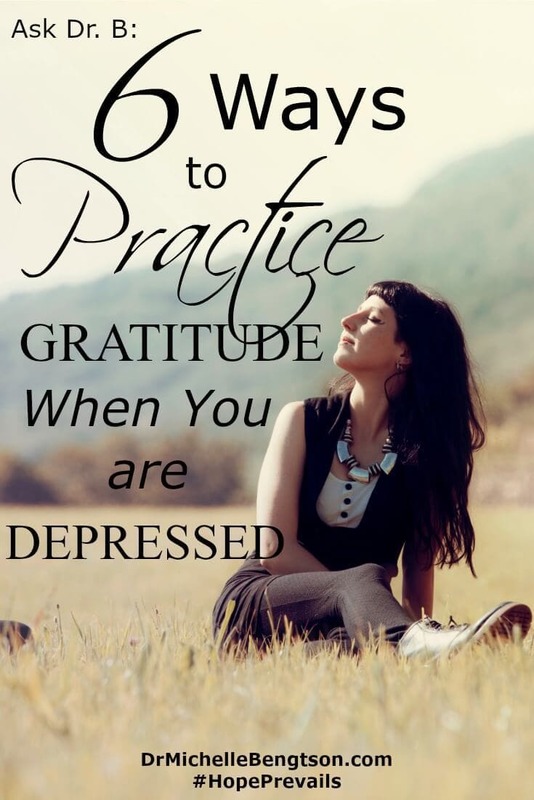 How do you practice gratitude when you’re depressed? -Think back to the times when you were struggling and others showed you acts of love and kindness that made a very real difference for you in the moment. A glance, a hug, a heartfelt prayer, a meal, a conversation…anything that conveyed you were noticed, you were important, you were cared about. Be thankful for that expression of kindness and consider showing a similar display to someone else. -Depression is often accompanied by physical ailments. When you focus on the areas of your health that are unaffected by your depression, you take back some of the power that depression has stolen from your life. If the only area of your physical being unaffected by depression is your appendix, thank goodness you still have an appendix to be unaffected! -Experience is often our greatest teacher. While I know of no one who would volunteer to experience depression, it can teach us many things. In my own experience, it taught me greater compassion for others, increased sensitivity to the vast array of emotions God gave us, and greater kindness toward myself and those around me. Now instead of always hurriedly wishing trials away, I try to focus on what I might also learn through them and practice gratitude for the life lessons. -Depression has a way of forcing us to focus internally. If we aren’t careful, it reduces us to a never-ending cycle of self-pity. To decrease your negative propensity and increase your attitude of gratitude, focus your attention externally. Challenge yourself to write down five different things each day outside yourself for which you can be thankful. Here are some ideas to get you started: 1) The sunshine to warm your back, 2) A cup of hot tea to warm your toes, 3) A good book to read, 4) A stranger’s friendly smile, 5) A green traffic light to help you get to work on time, and 6) Flowers still in bloom in winter. There were six…see how easy that is? 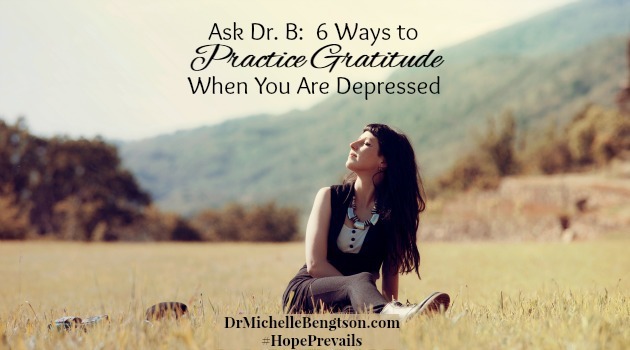 -Depression focuses our attention on the have-nots. By doing for others who have-not, it extends hope to others and makes us more thankful for what we have. Look around yourself and see what small (or not so small) act you can do for someone else: buy a cup of coffee for someone else on a cold morning; bring in your neighbor’s trash can on a windy day; offer to walk your neighbor’s dog when you walk yours; offer a smile and “good morning” to a stranger. Some of the kindest acts cost the least, and end up improving our mood, and making us feel grateful for what we have in return. -Find something to be thankful for. Say it out loud verbally, “I am thankful for ____ (i.e. the flowers by the roadside, a break in the rain, enough gas in the car to make it to work, etc. )”, say a prayer and thank God for even if it is a quick 20-second “Thank you God for ___.” Start somewhere. The hardest part of any behavior is getting started. Then do it again tomorrow and again the next day. Ask God to make it easier each day. Then tell someone else about it. If you are thankful for the flowers by the roadside, tell someone at work about them –it’ll help you remember them the rest of the day. I so loved this post. So much good stuff loaded into one post. My post this week was about the replays of the negative in our lives that happens in my minds. We let the story-line of that which hurt us go round and round instead of changing that replay to the story-line of the good in our lives. Your words here were another affirmation of the direction God took my writing in that post! Thank you! Lori, I love when God confirms a word in our own lives through the words of others. When we aren’t careful, we can get trapped in the negative vortex. A little shift toward the grateful can make such a big difference not just in our own perspective, but in that of those around us as well! Keep smiling, keep blessing, and keep thanking! Because of Him, #HopePrevails! What an accurate analogy! Glad you find the doors useful. Here’s hoping others will also! Because of Him, #HopePrevals! This post has so much good information. Thank you, Michelle. This time of year is hard for so many who suffer from depression. I know your words will help. Thank you for your encouragement Laura. It is a difficult time of year. I pray this encourages them and offers hope and help. Because of Him, #HopePrevails!